Is it time for a new Thames walking bridge in Waterloo? The controversial Garden Bridge is looking ever more likely to be cancelled, but I wonder if the footbridge I propose might appeal to pedestrians, cyclists, and motorists (especially bus drivers)? 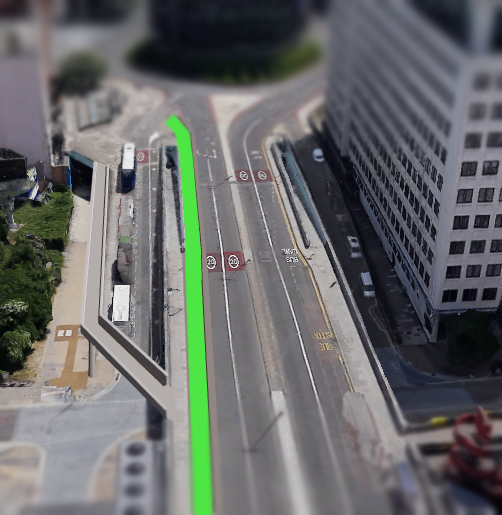 You can get an idea of the proposed bridge, built out from Waterloo Bridge approaching the IMAX roundabout, in the illustration (kindly drawn up by Iain Longstaff) below, with the cycle track that it enables shown in green. To give it context, Waterloo Bridge has just become part of Quietway 1. Quietways are "routes which will overcome barriers to cycling, targeting cyclists who want to use quieter, low-traffic routes, providing an environment for those cyclists who want to travel at a more gentle pace." The start of the bridge southbound from Westminster, albeit not perfect, isn't bad. There is however a significant issue for the Quietway towards the exit from Waterloo Bridge. Despite being an enormously experienced London cyclist, I don't enjoy this section and I know that it doesn't appeal to the people I give cycle training to. Independently of the Quietway, Transport for London have just started consulting on plans to turn Waterloo Roundabout into a peninsular and improve the space for active travel (walking and cycling). It is clear that a lot of careful and good work has gone into the plans, but the same problem remains . 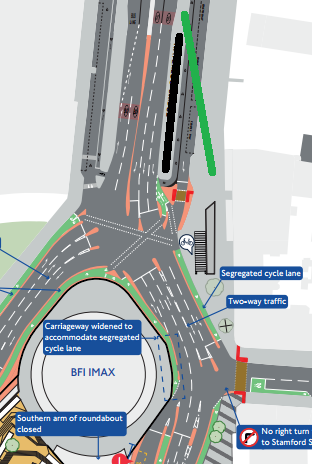 The plans don't provide Quietway quality space for cycling until after the bridge end, and even then the queuing space at a red light is tight for the increased number of people who will be cycling here. 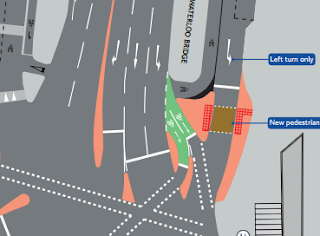 According to TfL the problem is that the width available between the pedestrian ramps on each side of the bridge doesn't allow for the provision of a dedicated cycle lane alongside lanes for motor vehicles. Pedestrians are also ill provided for, with a narrow strip of pavement close to the traffic. Below, the view from outside Kings College towards Waterloo Bridge - I don't think a new pedestrian bridge here would wreck it. A small downside, depending on detailed design, is that tall vehicles (coaches for example) may no longer be able to use the on-ramp from Upper Ground to the former roundabout, but there are many other exits from Upper Ground and Belvedere Road they can use.